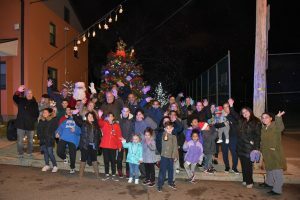 The North Bergen Housing Authority helped ring in the holiday season with its third annual Tree Lighting at Meadowview Village Monday, a prelude to the upcoming Christmas Party on Saturday, Dec. 15. With holiday music playing and artificial snow generated by machine, more than 50 residents were treated to hot chocolate and cookies. NBHA Executive Director Gerald Sanzari, Mayor Nicholas J. Sacco. 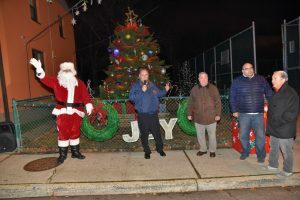 Revenue Commissioner Julio Marenco and Freeholder Anthony Vainieri were also on hand to welcome Jolly Ol’ St. Nick. That tree, planted four years ago, now stands over 10 feet tall. 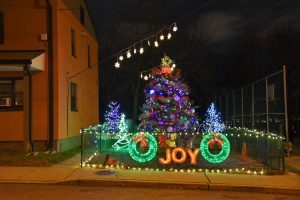 With a specially decorated mailbox, direct to the North Pole, kids under 12 are encouraged to write a list of gifts they’d like and drop them inside. “At the annual Christmas Party, also at Meadowview Village, we ensure that the children receive at least one reasonably-priced item from the list,” Sanzari said. Santa will pose for photos and pizza and refreshments will be served at the Dec. 15 party, which begins at noon. The party and gifts are funded though NBHA’s non profit 3 c Charitable organization The North Bergen Renaissance Corp.